Once upon a time? a simple story? the little giraffe was born on 25th May in year 1961? Saint Sophie's day. In those days? the only animal toys available were farm animals or pet figures. That is why one day in France a certain Monsieur Rampeau? who was an expert in transforming sap from the hevea tree using the rotational moulding of rubber as a toy-making concept? came up with the idea of designing a giraffe. Such an exotic wildlife figure would be a first on the market and its size and shape would be ideal for a baby's small hands to grasp. Sophie the Giraffe? who looked exactly the same then as she does today? went into production on Thursday 25th May. She was an immediate success. Sophie quickly became a must have in babys essentials. Designed to stimulate the senses and soothe teething gums? 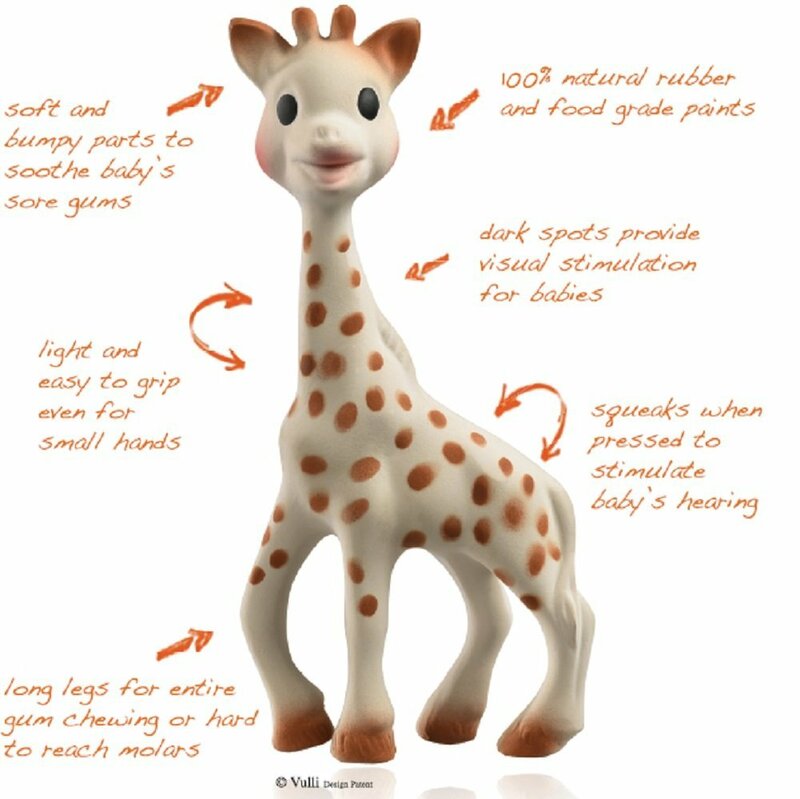 parents recognised right away the benefits of this little giraffe for their child. By simple word of mouth? the little giraffe's fame spread. From then on in Europe? generation upon generation of children were to love hearing Sophie squeak whenever they pressed her tummy or head. Vulli? a company based in Rumilly in the Haute-Savoie region of France has continued to keep the jealously guarded secret of how this wonder toy is made. Sophie the Giraffe is still "traditionally" produced to this day? a process that involves more than 14 manual operations. This includes individually hand painting each giraffe meaning that no two Sophies are exactly the same. Made from 100 per cent natural rubber derived from the sap of the Hevea tree? Sophies flexible? renewable? natural materials and non-toxic food grade paint mean she is a safe and natural teething toy for your little one. Over time the paint may wear off Sophie as baby plays - especially if she is chewed lots or harsh chemical wipes are used on her. Since her creation in 1961 Sophie the Giraffe has wowed over 50 million babies (and parents) worldwide with her natural beauty and charm and her retro style has ensured that she has remained fashionable for over 50 years. In France nine out of 10 new-born babies are given their own Sophie la giraffe. Still the same? even after more than 50 years? she hasnt dated in the slightest. For the last 2+ years Sophie has been manufactured with a batch number on the leg. Prior to this it was possible to buy a Sophie with no batch number? so if she is missing one this does not mean it is a fake. The batch numbering method has changed across time as manufacturing methods improve - originally batch numbers were part of the mold so would feel raised on the leg of the toy. Currently they are laser etched and so are very easy to miss - it's very? very faint but is there if you have a close look. This is done? so it does not spoil the aesthetics of the toy? but is there for identification.